Kalee Crowe, middle, front, is flanked by her parents, Jason and Teresa Crowe as she signs a letter of intent to attend Rio Grande University where she will continue her education and be a member of the newly-formed women’s bowling team. Standing (l-r); are Rio Grande head coach Bret Little, Crowe’s brother, Ryan and high school coach Ron Amore, Jr.
Springtime will soon be upon us. The robins are returning north and high school seniors are finalizing their college plans. Washington High School senior Kalee Crowe has made known her decision regarding college. 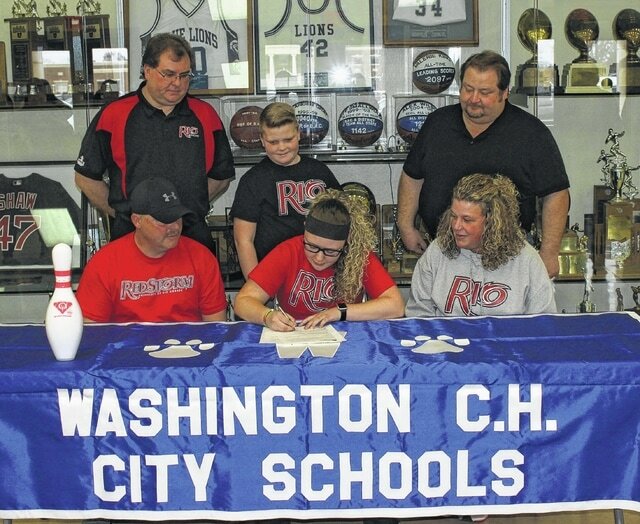 On Monday, Feb. 27, Crowe signed a letter of intent to attend Rio Grande University where she will continue her education and be a member of the new women’s bowling team. Crowe was joined for the occasion by family and friends, coaches and administrators in the lobby outside the gymnasium. “I’m really excited about it,” Crowe said. “I’ve been bowling for, this is actually my third year. I bowled in one league when I was little, but, it was nothing serious. Then, I picked it back up my sophomore year. What course of study might Crowe pursue at Rio Grande? What about a favorite subject in high school? In addition to bowling, Crowe will soon be playing her fourth year of softball for the Lady Lions. What about a favorite memory or accomplishment during her high school bowling career? “I remember last year, we had a home baker bash,” Crowe said. “It came down to us and Jonathan Alder. Jonathan Alder is a really good team. Their fifth bowler has a full ride to college for bowling. She was pretty good. We ended up beating them and winning our baker bash. “We’ve gone to Sectionals and Districts the past two years,” Crowe said. “I remember my sophomore year, I missed going to State by one pin. We finished third at the District this year. “I think I’m pretty ready,” Crowe said of moving on to the next level of collegiate bowling. “I’ve only been bowling for three years, but, I’ve learned a lot from Ron. Macy’s helped me a lot and the Trace coach, Kaleb Taylor. I can still improve by practicing every day, picking up spares and just getting used to the different lane conditions and adapting to them. 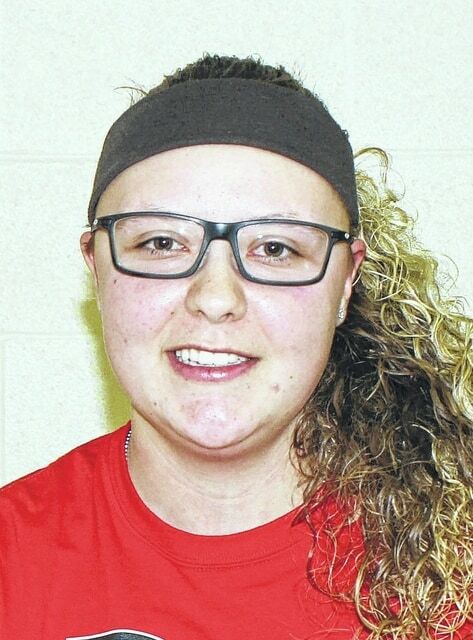 Crowe will join Miami Trace senior Macy Detty on the Rio Grande bowling team. “They should have a real good team,” Amore Jr. said. “She’s probably our No. 2,” Rio Grande head coach Bret Little said. “Macy’s our No. 1, Kalee’s our No. 2. There will be competition for the (No. 1 spot). We’ll get them trained up and see where it shakes out down the road. Rio Grande has landed another terrific bowler from Fayette County for their team.